The growing popularity of social video represents a massive opportunity to reach a large and captive audience. But with such a vast array of social media networks to keep track of, how can brands navigate their way around them successfully? And what can they learn about the where, what, and why of current social video viewing habits in order to capitalize on them? To help answer these questions, Brightcove commissioned research firm Vanson Bourne to examine consumers’ changing social video engagement habits and preferences and ascertain how brand social video in particular is driving, or has the potential to drive, behaviours across the buying cycle. 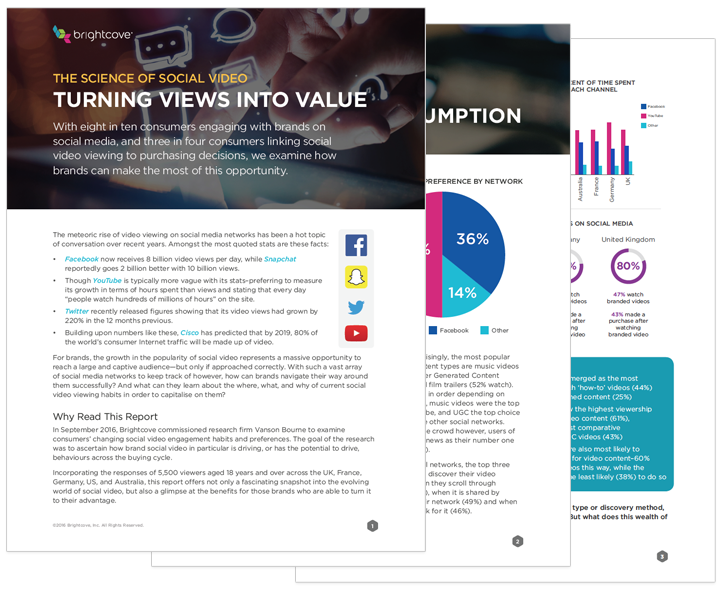 Incorporating the responses of 5,500 viewers across the US, UK, France, Germany, and Australia, this report offers not only a fascinating snapshot into the evolving world of social video, but also a glimpse at the benefits for those brands who are able to turn it to their advantage.